Today on Richard Carr’s Commercial and Residential website, we take a look at an article wrote about the entrepreneur when he was aged 29, by the Alfred Lambs magazine. 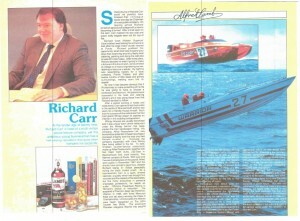 The full two page feature, which talks about Richard Carr’s early years in business and his powerboat career, is available to read in the ‘Press’ section of his website. The lengthy article opens by explaining Richard’s route into the fast food outlet industry, beginning with the time he spent as a farmer during his spell in agricultural college. The feature spells out Richard’s desire to constantly better himself and become a successful businessmen. It took a number of small-time jobs before Richard eventually landed on his feet. He worked on motor cruisers as a handy man; took a course in heavy engineering which set him as a welder for twelve months and then slowed made his way into the leisure industry working in hotels and restaurants. Richard Carr opened a fast food outlet in the centre of Bournemouth and for two years ran a Hamby House, with great success. His potential was recognised by fast food giants Wimby and it was his relationship with them that kick started his business career. As well as providing well-articulated, thought provoking blogs on industry news, Richard Carr will also use his website reflect on newspaper interviews relating to his previous business ventures. Richard’s interviews are available to read in full via the ‘Press’ section of his website. Below is a flavour of what is currently available to read on PDF.